Ok, you really can't count this post for a book review but I disliked it so much I had to say so. I thought this book would be a great one to read about one of America's first "space heroes." You know -- it would be a really cool experience learning about Aldrin's trip into space and how he has lived his life since then, etc., all awe-inspiring and all. Rah! Rah! Rah! 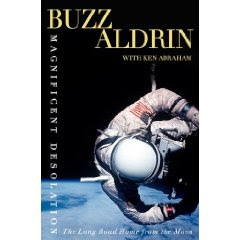 Originally I thought I'd either enjoy it as a great biography or I'd just skim it to learn interesting facts about Aldrin's walk on the moon and space travels. Instead I felt drawn in to read every single word the man wrote. Why? Because I'm sick, sick, sick! Morbid fascination, outright hilarity, sincere disbelief and because I was feeling like pointing out the log in someone else's eye, that's why! I am writing this book because mostly I wish to appear benevolent and because it's my hearts desire that you'll see through me and somehow still walk away with the delusion that I'm worth admiring. Yes, I left my first wife of 17 years but I had very justifiable excuses. She wasn't a believer in Buzz and although we're on friendly terms, she just wasn't cut out to live the life of being rich and famous - like I am. But just to be clear - I do not care about the money. Yes, I was an alchololic but in my defense "everyone else was doing it too" and I'm better than everyone else in AA because my picture was taken when I was standing on the moon. OH, and about that picture of me standing on the moon - the 'visor shot'. Even though some people have said that I hogged all of the camera time and make Neil Armstrong take a lot of photos of me, while refusing to give him equal film time, that is not true. There are more pictures of me on the moon than of Neil because he was the one holding the camera and it didn't have anything to do with the fact that I was better looking. Because, of course, you can tell through my whole space man outfit that I AM better looking. I can't help what I am. I can only work with it. I also can't help it that success found me even though I pretend not to deserve it in one sentence and then demand my royalties when NASA photographs are used with my next sentence. It's all about my personal rights, even though you can't really tell it's me in the astronaut suit. Obviously, my extreme good looks are being taken advantage of and I should be paid whenever you see the reflection of Neil in my visor. Also, I would like to go on record as saying that I had no qualms about Neil being the first man to set foot on the moon. At the same time, I would like to say how very shocked I was that the U.S. Government put his face on a U.S. postage stamp. My father and I would have preferred that the government put both of our faces on the stamp because I was just 20 minutes behind Neil. But Neil's a great guy and I don't harbor any resentment over this postage stamp deal, even though some say that I have and Neil is a lazy-no-good-bum because he doesn't promote himself the U.S. Space program like I do. In fact, no one works harder to promote themselves the U.S. Space program as much as I do. In fact, the fact that I have worked so hard to promote myself the space system has not gone unnoticed by those in Hollywood, world politics, the big screen, or by senators with private jets who offer me flights with some regularity. And nor should it! As my wife, Lois, frequently says, "The business is Buzz!" and I couldn't agree with her in a more humble fashion. The fact is, I just have great things to say. All the time. In fact, you probably couldn't find a more outgoing person with greater charisma to support the U.S. Space System. I've got it all - the looks, the charm, the fashion, the money (although my first year of public speaking only garnered $250K and one time I had to fly business class all the way to China). People just love me and that's why I should be the one talking about the Space Program and a lot about my own private brand, Rocket Heroes. But the truth is, even though I have all of this power and prestige and we live in a top-notch, high-rise apartment near Hollywood, which is convenient for the type of work that I do now, I'm really just a low-key, fun-lovin', romantic kind of guy. In fact, just the other day a famous friend of mine died and my third wife, Lois, and I went to the funeral. After the burial I walked her over to another plot within the same graveyard for the rich and famous. I said to her, "Lois, there you see my parents grave site. And right next to them is where you and I will be." I wanted to communicate to her that my commitment to my third wife, even though I dated a lot of other people while I was dating her (and even thought this angered her and caused her to unnecessarily break up with me one time), I was committed to her. I will stay with her until I die because I'm almost 80 and even though I still have my dashing good looks I kinda doubt anyone else is going to be interested in me romantically anymore. Although stranger things have happened and frankly I wouldn't be surprised if I got a call from Angelina Jolie sometime. I'm sure she knows that only *I* have the power to offer her son a ride in the next tourist space craft. You just never know. But where was I? Oh yes, so I was standing in this graveyard with Lois and I pointed out our sites and she looked at me, moved with emotion and said, "Buzz, that is the sweetest thing you've ever said to me." What can I say? I have natural charm. Now that I'm nearing the end of my life I would rather not think about death. I mean, I know it's going to happen and one day I'll be looking down at all of you from among the stars. I will smile down upon you and you'll know that Buzz Aldrin, American hero and role model for millions of people everywhere, still has a dream. That dream? That my footprint really will be on the moon for a million years and that Lois will find a way to capitalize on that fact and that somehow or another I'll be able to profit from it, even though I'll be living in the stars. Life is an amazing thing if you're blessed with good looks, charm and an ambitious wife who likes to ski very well (and has friends who own chalets in Switzerland). If you aren't blessed with these things, then I'm sorry but I probably don't know you. Who are you and why are you reading my book? P.S. Someone stole the watch that I wore on the Apollo 11 mission when it was in transit from Houston to the Smithsonian. I'm told it's the Holy Grail of space collector's items so if you find it, please return it to the Smithsonian. I would love to touch it again with those special white rubber gloves that allow you to touch anything you want without leaving smudge marks. Oh my. Sounds...awful. Fascinating in an awful way. I can understand reading it all out of morbid curiosity and then thinking "did I really just read that?" Pardon the LOL but that is what I am doing! I'm sure this is way more fun than reading the book! How sad! Loved your review. I feel like now I know the man and don't feel the need to read the book at all. Thanks. Aldrin was at the Texas Book Festival that I went to in Austin this past weekend. I didn't hear him speak because the line was a mile long to get into his lecture. And people were snapping up his book right and left. I hope they weren't too disappointed when they "unwrapped the package" so to speak, but it sounds as if it might have been a line, and a book, I was better off to have missed.